So Now Steve Ballmer's Resigned - Why Was He Pushed, How Did He Do? Pretty much at the peak of the dotcom boom, Steve Ballmer took the reins at Microsoft - at the time, the biggest job in the tech industry, perhaps in any industry. And now, he's resigning. 4 - And... How Well Did He Do over his twelve and a half years in the top job. There have been or report cards, but here we compare their take on such things with our own... The results are quite different. Well... Yes. He's as good as said as much. As to who, the answer is quite obvious: lots of people pushed, and Bill Gates finally decided to stop resisting the pressure. The pushers probably include not just the board at Microsoft, but various activist shareholder groups (one often quoted is known as ValueAct) and members of the press. That seems fairly clear too: the top issue that he could no longer duck was the poor reception that the has been given to the new version of Microsoft's core desktop operating system, Windows. This was meant to be quite a departure from its predecessors in that it was designed to run with touch screen devices - desktops and laptops, but most importantly tablets. However, neither Microsoft's own Surface tablet, nor any other Windows 8 mobile offering, has managed to dent the market share held by the iPads and all the Android tablets that are now flooding onto the market. 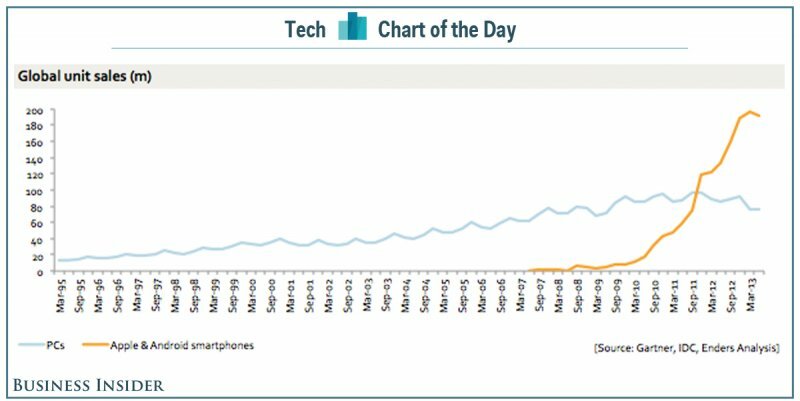 To say that this little graph demonstrates the problem is putting it mildly. However, the seeds of destruction were sowed a while ago. Both the Windows operating system itself and Microsoft's Office suite of software that runs on it, have not really been evolving healthy. In particular, they are very greedy for resources - resources that were quite cheaply available within a desktop, but that now need to be used with great care in the physically smaller and power-limited tablets. Unwisely, both Windows 8 and the Surface were released in two flavours - one for the X86 chips like the ones from Intel that Microsoft are familiar with, and a second flavour for the newer, power-efficient chips designed by Arm Holdings of the UK. Despite many market indicators suggesting that Windows 8 was not doing so well, Microsoft ploughed on until the release of their last set of figures in which they wrote off $900 million on the value of unsold stock of Surface tablets. 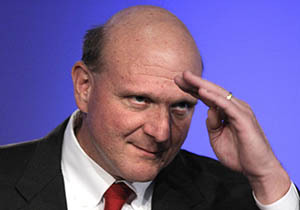 Steve Ballmer has survived big write-offs in the past, in particular $6.2 billion lost by purchasing aQuantive. This time, though, the loss is a reflection on the prospects for Microsoft's core businesses - it's a predictor of leaner times ahead. The feeling is that Bill Gates supported Steve Ballmer through thick and thin - beyond the point where other company chairmen might have lost patience - but enough is enough. 4 The report card - how did he do..?